PHOENIX – Arizona educators have overwhelmingly voted to walk out to demand higher pay and more dollars for the classroom. 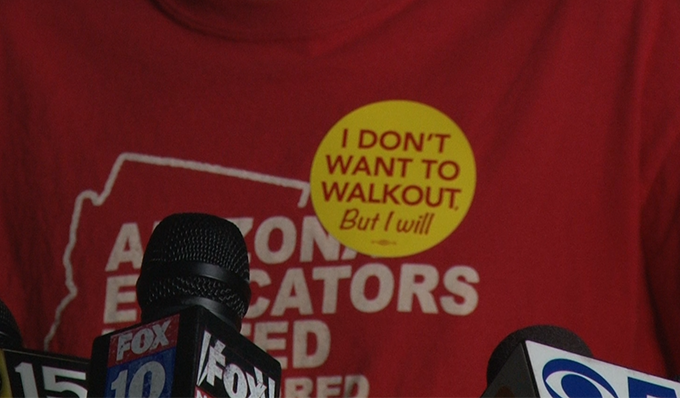 Speaking Thursday night in front of the Phoenix headquarters of the Arizona Education Association, organizers with Arizona Educators United, one of the grassroots groups backing the Red for Ed movement, said 78 percent of the 57,000 educators who voted supported the walkout. Monday through Wednesday, teachers will continue hosting walk-in demonstrations at more than 1,100 schools. But on Thursday, many of those schools will shut their doors as a walkout begins. As state employees, teachers are forbidden to strike. Red for Ed leaders say a walkout technically is not a strike. Before the vote, Mesa Public Schools Superintendent Michael Cowen sent an email to teachers saying the district’s 64,000 students would be shut out of school until teachers return to their classrooms. Other districts likely will follow suit. Cowen cautioned teachers to think about the difficult decision during the voting process, which ran Tuesday to Thursday. Thursday’s decision comes one week after Gov. Doug Ducey proposed a plan that would increase teacher salaries 20 percent by 2020. Advocates said the plan would help teachers but would not provide money for support staff, including counselors and janitors. Ducey is holding firm on his pledge to not increase taxes, instead relying on the prediction of a strong state economy over the next three years to fund the pay increases. Some legislators have called his predictions optimistic. The Legislature would have to approve funding for the plan. After Thursday’s vote, the Arizona Education Association called Ducey’s proposal disingenuous and said it wasn’t supported by actual funding. Ducey responded to the announcement on Twitter, saying when teachers strike, “our kids are the ones who lose out.” The governor said he would continue to advocate for his proposal to increase teacher salaries. Some educators said they were concerned about the lack of funding for support staff and for resources, including textbooks.